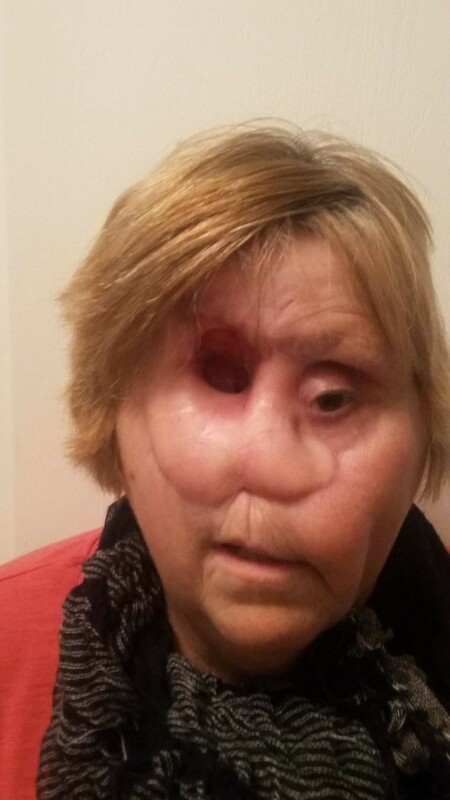 A mother has been left with a gaping hole in her face after surgeons were forced to remove her nose during a life-saving operation. Ida Deslandes now breathes through a 'blowhole' above her right eye socket after medics discovered her stage four cancer had spread. 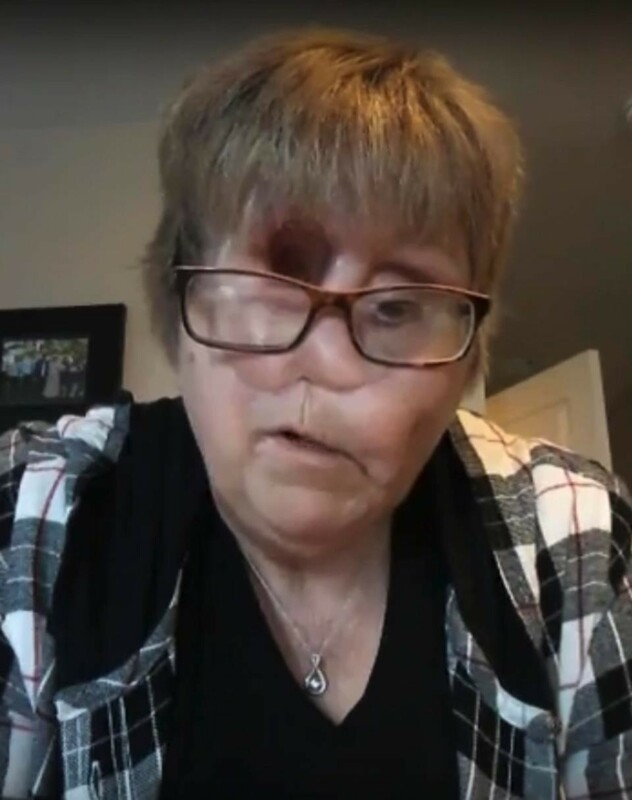 The 60-year-old also lost her right eye during the procedure and claims she had not been warned she may wake up without her nose. Speaking about her ordeal for the first time, Mrs Deslandes, who has two children, said all she wants is a face 'before she dies'. Now Mrs Deslandes, who underwent the surgery in March 2014, is cancer free and trying to raise the money she needs for a new face. She did not know what her face looked like for five weeks following the surgery and said she was 'devastated' when she finally saw her reflection. Mrs Deslandes, from Smithville, Ontario, said: 'I had an 18 hour operation. 'I had not been warned I would lose my nose but they told my husband Randy following the surgery. She added: 'I breath through the hole in my head. I call it my blowhole. The past few years have been full of ups and downs. I feel like l live in a fishbowl. 'People do stare at me and they say horrible things. To them I'm a freak. 'We've had friends say that they can't eat around me because my face makes them feel ill.
Mrs Deslandes was diagnosed with eye cancer in November 2013. During her battle, she also suffered a heart attack and stroke. Radiation caused her top teeth to crumble, before she had the cancer removed by a team of specialists at St Joseph's Hospital, Hamilton. Surgeons, led by Dr Michael Gupta, Dr Carolyn Levis and Dr John Harvey, took a patch of skin from her back and attached it to her face. Since then she has undergone eight facial operations in a bid to reconstruct her eye socket and nose. Praising her 58-year-old husband for standing by her, she said: 'Randy met a nice looking strong woman it 2000 and ended up with a freak in 2014. 'Most men would have walked away. But not Randy - we are in it together for the long haul. But she has drained her retirement savings during her battle with the cancer and reportedly bankrupted her business. She eventually will be given a new prosthetic face - along with an artificial eye. However, it is unsure when Mrs Deslandes will undergo the procedure as she has to undergo several other operations first. Her friend Sharon Williamson is now raising money for her reconstructive surgery. She said: 'Ida is desperate for a new face.